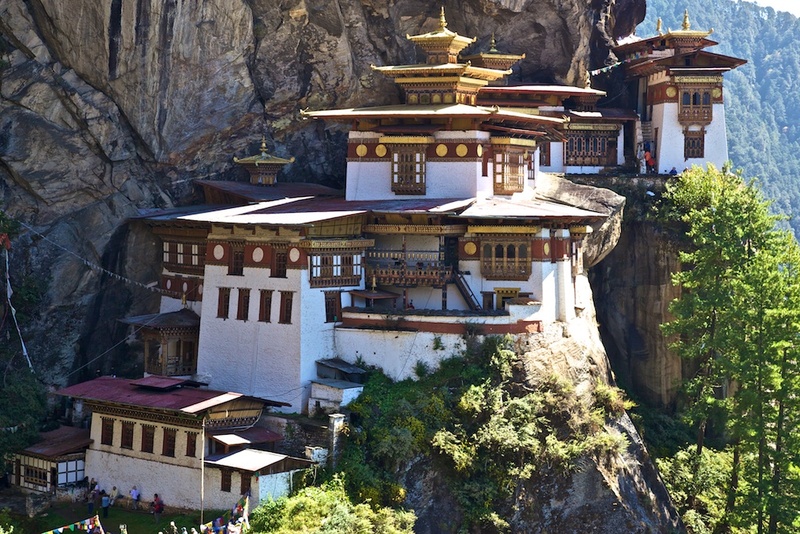 The Paro Taktsang Monastery, also known as ‘Taktsang Palphug Monastery’, is one of the most important Buddhist sites in the Himalayas. 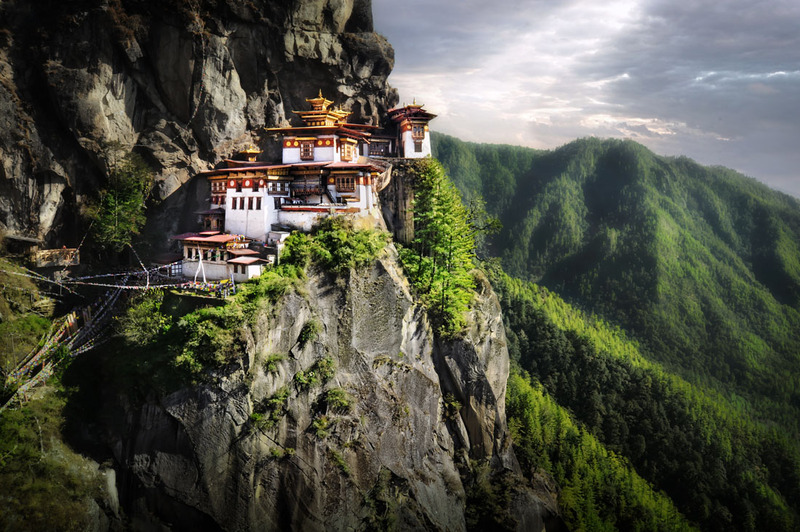 Perched on a high cliff in Paro Valley in Bhutan, this picturesque monastery is also known as the ‘Tiger’s Nest Monastery’. Back in the 8th century, Guru Padmasambhava , or Rinpoche, is said to have meditated at the cave of Taktsang Senge Samdup for 3 years, 3 months, 3 weeks, 3 days, and 3 hours. Near this cave, a monastery was built around 1692. Guru Padmasambhava is the one who introduced Buddhism in Bhutan and is considered the patron deity of this country. 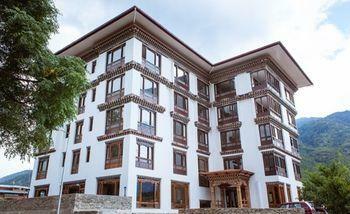 The word ‘Taktsang’ is spelled in Tibetan as ‘Stag Tshang’ which means a “tiger’s nest” or a ”tiger’s lair”. The myth states that Rimpoche arrived from Tibet to this location on the back of a tigress and thus, this monastery got its present name. 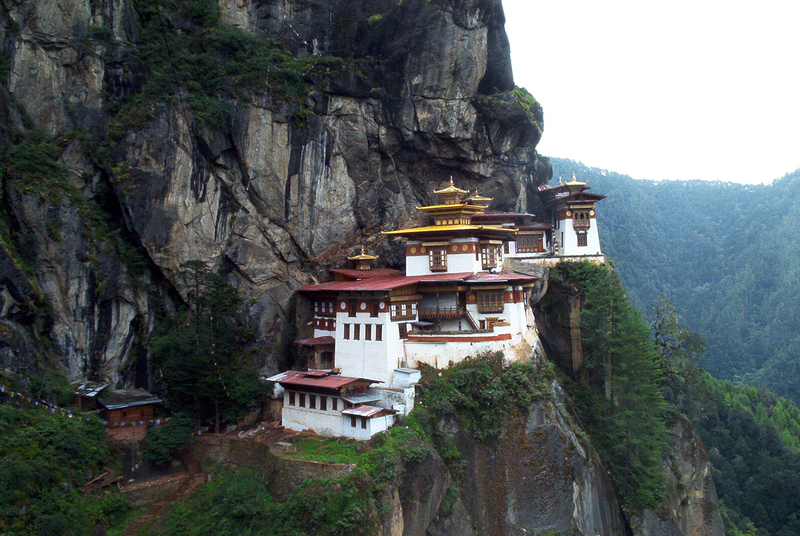 Situated at a distance of 6 miles from Paro, (North) this monastery lies on the edge of a cliff at a height of 10,236 feet. 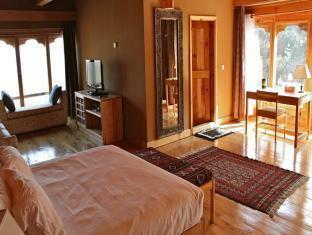 The cliff rises above 2,953 feet from Paro Valley, on the right of the Paro Chhu River. The rocky slopes encircling this monastery are very steep and formidable-looking. However, one can enter this monastery from a number of directions like the forest path in the northwest, the popular path of the south, or the path in the north which leads through a rocky plateau called 'Hundred Thousand Fairies'. There is also a path for mules and ponies which takes one through beautiful pine woods dotted with colorful prayer flags. On the way to this monastery, one can find another small hermitage called Lakhang and the Urgyan Tsemo Temple, which is located on top of a rocky plateau called ‘Copper-Colored Mountain Paradise of Padmasambhava’. This juncture also serves as a resting place for trekkers where they can enjoy a coffee or a drink while watching the stunning view of the mountains on the horizon. Beyond this point, the route becomes even more stunning with occasional waterfalls breaking the monotony of the mountainscape. One can also see a beautiful waterfall which drops into a sacred pool from a sheer height of 197 feet on this trekking route. 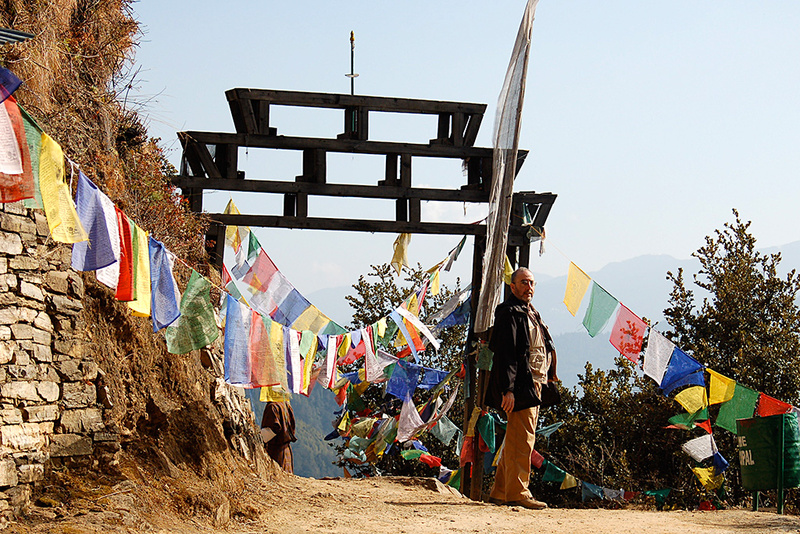 The trekking path in this mountain is scattered with many small temples and one can find many small shops selling religious paraphernalia like bells, prayer wheels, skulls, flags, and incense which often piques the curiosity of the travelers. It is said that Guru Rinpoche flew to Paro Tatsang from Tibet on the back of a tigress. According to another legend, Princess of Karchen Kingdom, Yeshe Tsogyal (777-837 A.D.), who was a disciple of Guru Rinpoche in Tibet, took the form of a tigress and flew to Bhutan with the Guru on her back. After a long period of meditation, Guru Padmasambhava manifested himself in eight different forms and consequently , place became a sacred one. There is a popular belief that Tenzin Rabgye, who constructed the temple in 1692, was a reincarnation of Guru Padmasambhava. He was capable of performing miracles and was said to have been seen by his friends both inside and outside the monastery, simultaneously at the same time. He could even feed a crowd of visitors with just a small amount of food from vessels that was never emptied of its contents. During his lifetime, the inhabitants of the Paro Valley saw the formation of many religious symbols and animal forms which used to appear and disappear within the sky itself. It was Guru Padmasambhava, or Guru Rinpoche, who established the Nyingmapa School of Buddhism in Burma, and is regarded as the tutelary saint of Bhutan. When he breathed his last in Nepal, his body is said to have miraculously transported itself to this monastery. The body of Rinpoche is still kept in a locked room in a ‘Chorten’, which one can see on the left hand-side of the entrance way of this shrine. 11th century onwards, many prominent Tibetan saints came to this monastery to meditate. The legendary Thangton Gyelpox, Pha Dampa Sangye; Machig Labdron, and the Milarepa himself had visited this monastery to pray and meditate inside this shrine. 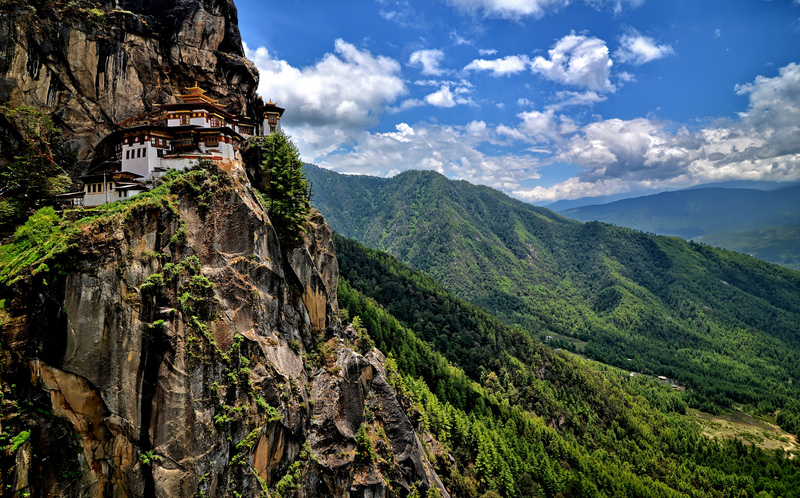 Sonam Gyeltshen, a Nyingmapa Lama of Tibet, came to Paro Taktsang during the 14th century. He brought many paintings along with him, some of which are still discernible on a rock, just above the main monastery of this temple. 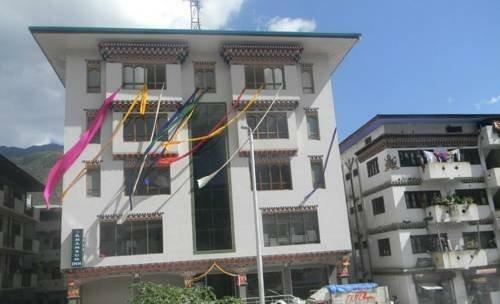 Pema Lingpa of Bumthang constructed many monasteries in Bhutan in the 17th century. He created a ritualistic dance form which is still performed in Paro at the Tsche festival. With time, he established himself as the ruler of Bhutan and acquired the title of Shabdrung. 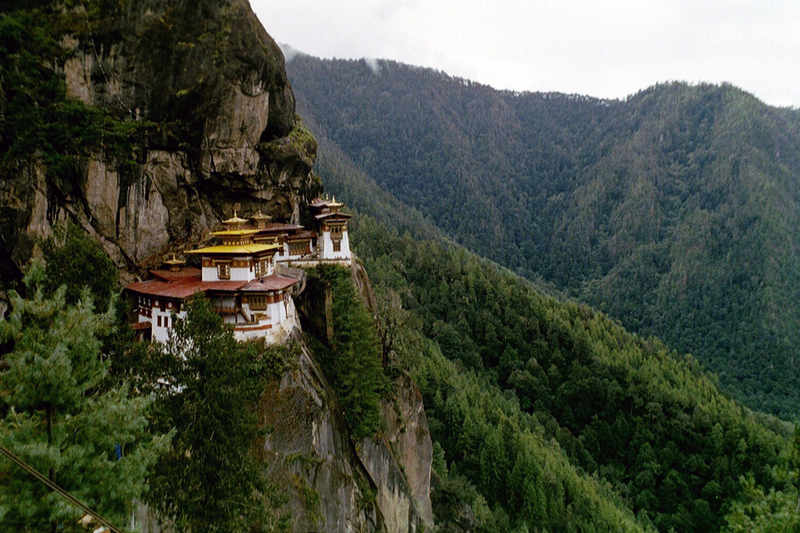 When Bhutan was invaded by Tibet in 1644, Shabdrung along with his guru invoked Padmasambhava near the cave at Taktsang so that they may emerge victorious in the ongoing war. After performing many rituals, Lord Padmasambhava was appeased and Bhutan was ultimately able to defeat the Tibetan forces. Shabdrung wanted to build a temple in honor of Guru Rinpoche and his wish was carried out by his successor, Tenzin Rabgye , who constructed this monastery in 1692. 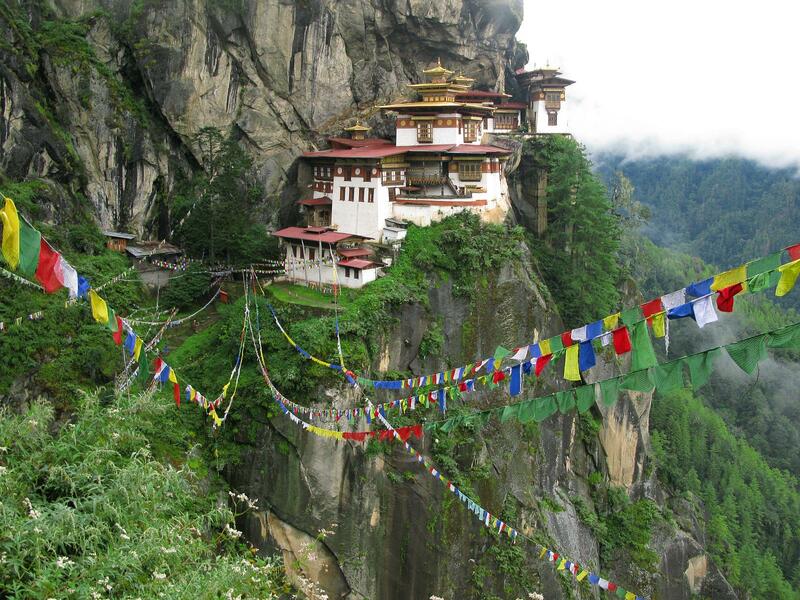 The Paro Taktsang Monastery comprises of 4 main structures which serve as temples and residential centers for monks. Out of the 9 sacred caves, only 4 can be easily accessed. 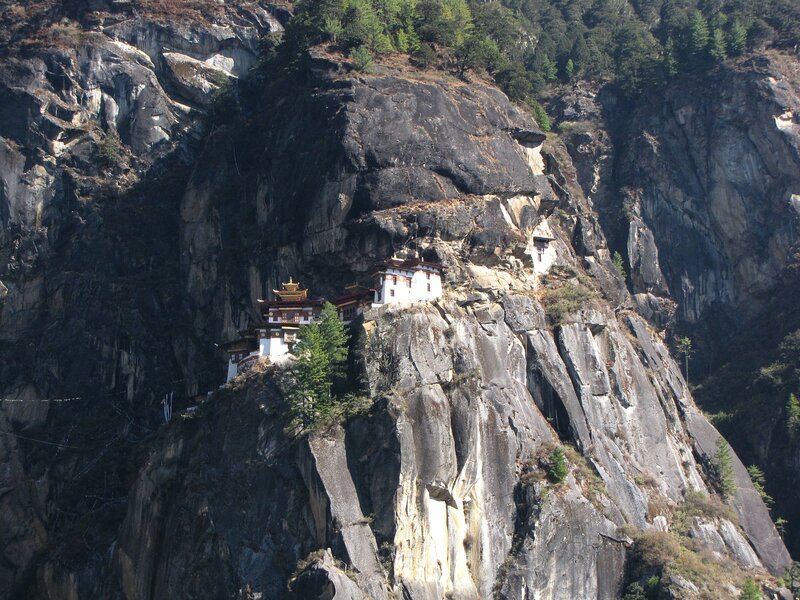 The cave where Guru Rinpoche first entered, and where he performed meditation, is known as Pel Phuk. A narrow passageway from the Phuk cave leads to the main cave which houses many statues and images of Bodhisattva s with lamps flickering on the floor. An adjoining cell contains the Holy Scripture which was supposedly written with gold dust, and powered bone of a Lama. Until today, monks of the Vajrayana Buddhist sect come here to meditate for a period of 3 years. All the structures in this holy shrine are connected with rock staircases and there are also a number of precarious-looking, wooden bridges which connect these buildings. 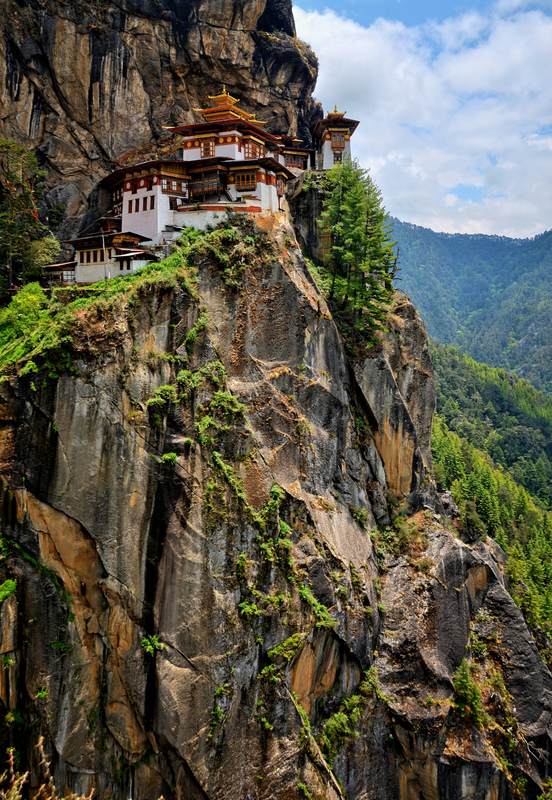 The highest temple in the Paro Taktsang Monastery houses a frieze of Lord Buddha. 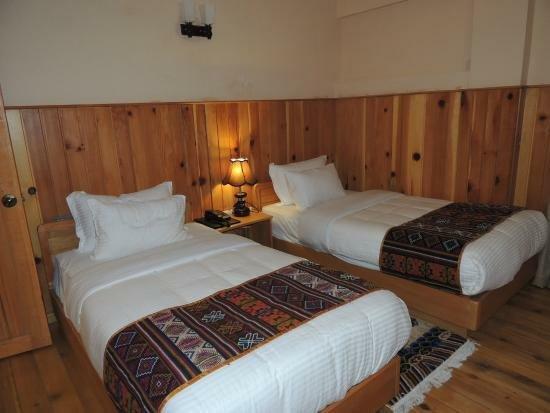 From the veranda of each building, one can get a stunning view of the surrounding mountains and the Paro Valley which is indeed a sight to behold. Other notable structures within the monastery complex include the Taktshang Zangdo, where Yeshe Tshogyal, the wife of Padmasambhava, lived during the bygone days. The Urgyan Peak or the Urgyan Tsemo is another important structure, above which the Phaphug Lakhang, or the Holy Cave Temple, is located in this monastery. 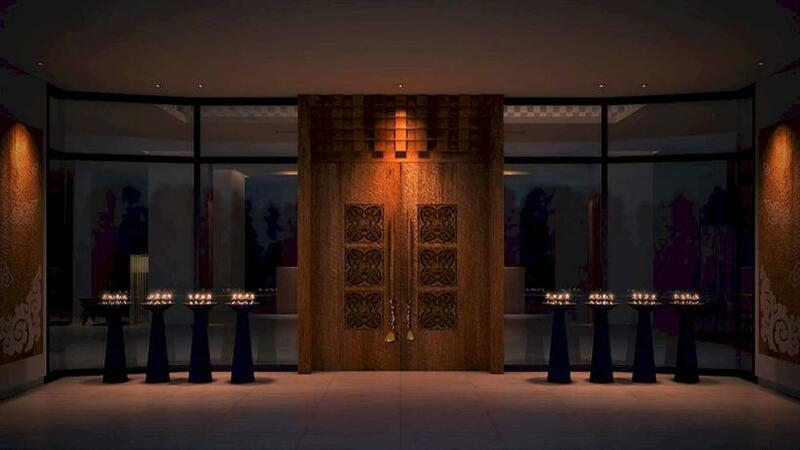 The visitor can find many colorful Buddhist paintings depicting Buddhist legends or forms of Buddha and Guru Rinpoche. The Zangdopari, or the Copper-Colored Mountain Paradise of Padmasambhava, is painted on every wall and displayed in the shape of a heart on each Tangka (a painting on a piece of cloth like cotton or silk which depicts a Buddhist deity or legend). Demi Gods with the body of a serpent and head of a human are also depicted in some paintings in this famous Bhutanese monastery. Tourists are required to contact a guide who would arrange a permit for them for visiting this monastery. The monastery remains open every day from 8:00 AM to 1:00 PM and from 2:00 PM to 5:00 PM, between the months of October until March. In the months of April to September, this monastery remains open until 6 PM in the evening. Visitors should avoid taking photos since photography is strictly prohibited within the premises of this monastery. One can hire a car from Paro and travel the distance of 6 miles to reach the base of this monastery from where one has to hike to reach the Tiger’s Nest Monastery. One can also hire a mule or a pony if one wants to avoid this arduous trek. 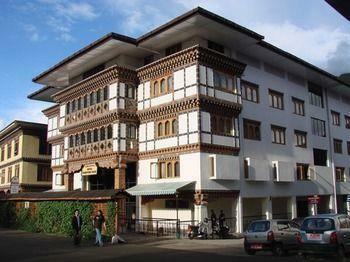 The picturesque town of Paro has the only international airport of Bhutan. The Paro Airport has regular flights to Kathmandu, Delhi, Gaya (India) , Kolkata, Bangkok, and a few other cities across the globe. The Rinpung Dzong is a monastery-turned-fortress situated in Paro. Travelers to Bhutan should surely visit the capital city of Thimpu where another fortress-turned-monastery called Tashichho Dzong is located, which is frequented by travelers visiting Bhutan.